Inter District Transfers schedule and latest guidelines released with Rc.No.686 in A.P Govt. As per this RC NO 686, Inter District Transfers schedule and some important guidelines are given below. i. Teachers / Headmasters working in State Government/ Zilla Parishad/ Mandal Parishad Schools are eligible to apply for Inter District Transfers under the same management. ii. Minimum service of the applicant teacher shall be 2 years as on 01.06.2018 in the present District and in the present category of post. iii. Teachers whose spouse is working in State Government / Central Government / State Public Sector / Central Public Sector / University / HODs/Secretariats / Local Body are eligible to apply. iv. Teachers whose spouse is working in HODs/Secretariats can apply for Krishna and Guntur Districts only. v. Teachers worked as Ex-Servicemen can apply for request transfer within the State. vi. Mutual transfers of the same category and of the same management would be permitted. vii. In case of Mutual transfers, both the teachers should give consent for such transfer and such consent shall be countersigned by the Mandal Educational Officer/Deputy Educational Officer concerned. ix. Teachers who are unauthorisedly absent, facing charges under CCA rules, under suspension are not eligible to apply. x. The applications of in-eligible teachers and in-complete applications will not be considered. xi. The teachers concerned shall be responsible for the correctness of the information furnished by them. ii. Only online application received through the specified website authorised by Commissioner of School Education will be considered at State level. iii. In addition, the candidates shall also download application form, fill up and sign give to the concerned Mandal Educational Officers. (This is only for verification - Hard copies are not processed for transfer). iv. The Mandal Educational Officer concerned should verify all the details / particulars with original records and certificates and after satisfying their correctness they shall submit to the District Educational Officer. v. Once the teacher enters application form online, thaf is final. No teacher shall apply twice in online. vi. A declaration shall be given by the applicant that he/she would forego his/her seniority in the old unit and accept to take last rank in the new unit (district). vii. 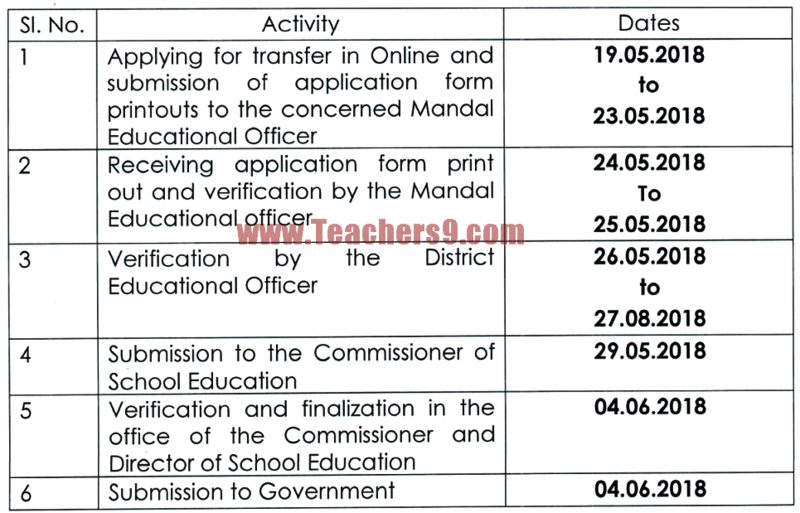 The District Educational Officer concerned shall forward the applications of the teachers in the prescribed proforma issued in Government Circular Memo.No.7232/MC-l/GAD/2011, dated : 04.08.2011.